Readers of Bad Blood: Secrets and Lies in a Silicon Valley Startup seeking engagement for all reading groups can gain further insight with this essential resource as a guide to aid your discussions. 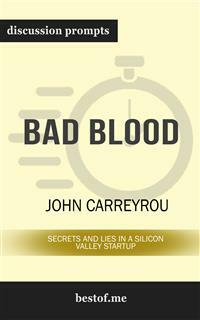 John Carreyrou’s national bestselling book Bad Blood: Secrets and Lies in a Silicon Valley Startup received positive reviews from critics. The New York Times Book Review says that Bad Blood is chilling and is like “a West Coast version of All the President’s Men." Prize-winning journalist Carreyrou reveals the full inside story regarding the rise and fall of the multibillion-dollar biotech startup Theranos. He was the first to break the story and he pursued it until the end in the midst of pressure from the CEO and threats from her lawyers. In 2014, the CEO and founder of Theranos Elizabeth Holmes were labeled the female Steve Jobs. She was backed by multi-billion dollars worth of investment. There as just one problem: The technology failed to work. Bad Blood: Secrets and Lies in a Silicon Valley Startup is a riveting story of one of the biggest corporate frauds since Enron. This is a story of ambition, lies, and hubris set in Silicon Valley. In this comprehensive look into Bad Blood: Secrets and Lies in a Silicon Valley Startup, you'll be equipped to prepare with the following: Discussion aid which includes a wealth of prompts and information Overall plot synopsis and author biography Thought-provoking discussion questions for a deeper examination Creative exercises to foster alternate “if this was you” discussions And much more! Note to readers: This is a companion guide based on Bad Blood: Secrets and Lies in a Silicon Valley Startup. This is meant to enhance and aid your reading experience, not to replace it. We strongly encourage you to purchase the original book before purchasing this unofficial companion guide. Have you ever wanted to improve your understanding of Bad Blood? Or perhaps you are simply struggling to learn the subject matter? It’s a simple teaching technique that helps students learn and readers to grow. With versatile discussion questions for each major criteria regarding Bad Blood, these discussion prompts are designed to help surface crucial discussions that are capable to assist toward thinking and learning on a deeper level. rize-winning journalist Carreyrou followed the breathtaking rise of Theranos, a multibillion-dollar worth Silicon Valley startup. It was a very promising company. Then one day everyone was astonished by its collapse. In his book Bad Blood: Secrets and Lies in a Silicon Valley Startup, Carreyrou tells about the tale of ambition, lies, and hubris of this great Silicon Valley healthcare startup.